There’s a spot behind the Barra Lighthouse where you can sit with your back to the cobbled wall of the fort and imagine you’re on a small island surrounded by the glistening dark blue sea. Greeny-grey lizards dart around, huge container ships slowly drift past on their way to and from the port, and tranquility reigns. Amid the birdsong and waves crashing on the rocks below, carried on the wind you can just make out the sound checks before another day of carnaval begins. Seven days of absolute madness! 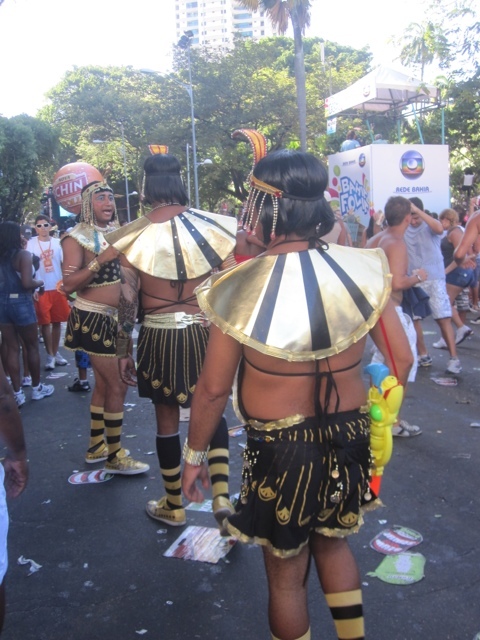 When you think of Carnaval, you’re probably picturing the vibrant imagery at the Sambadrome, Rio’s home of festivities, where scantily clad floats of dancers parade with all manner of feathers and colour. Throw that picture away. 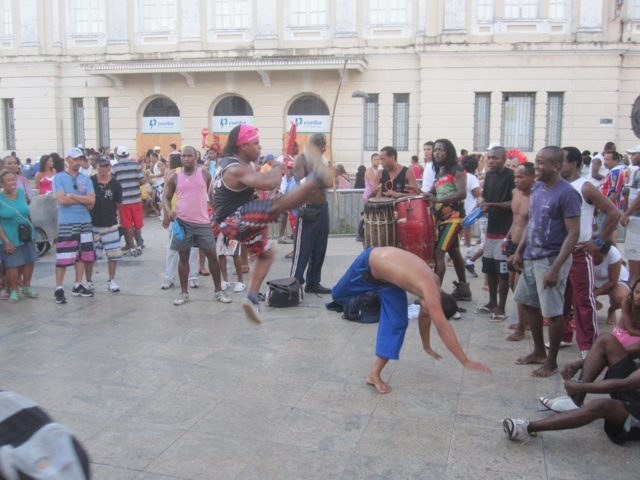 We’re in Salvador, the original home to the celebration where they do things very differently! There are really two different festivals going on here, with a very different vibe to each. 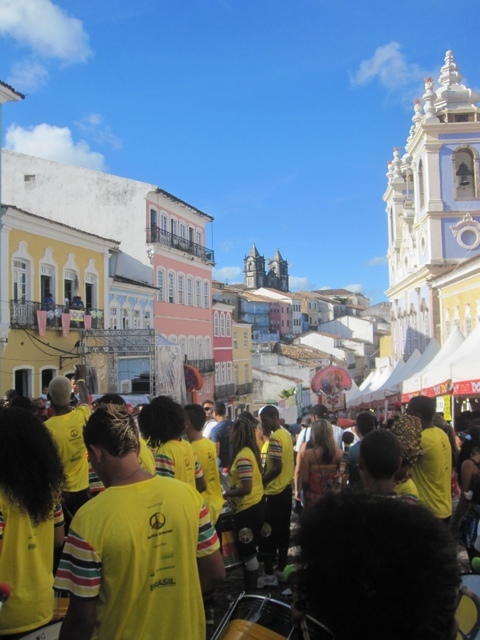 The first was much more of what I was expecting, in the old city of the Pelourinho where the cobbled streets are filled with the sounds of samba bands marching, dancing their way between the colourful buildings and the place is alive with a traditional, friendly, family atmosphere. It’s touristy, the cool breeze blowing through the heights of the city is lovely, and you can imagine this celebration has been the same for generations. Pure bliss, and a great afternoon escape from the other half of the party. 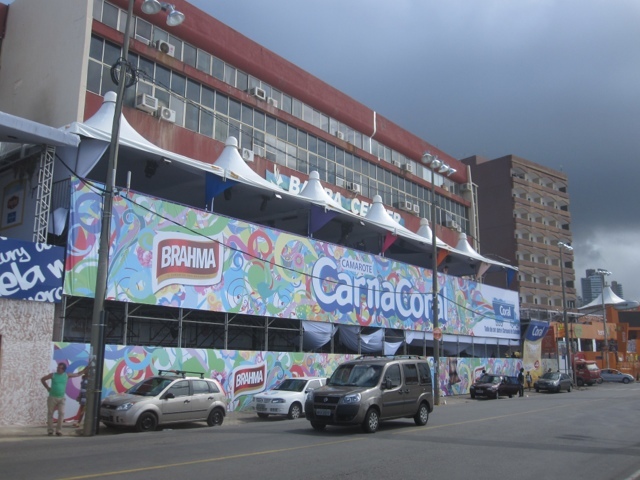 The second side of Carnaval is in the districts of Barra and Campo Grande, who host a street party unlike any other – probably the biggest in the world (Rio’s sambadrome is only a few hundred metres long, the parade route here is over 10km). 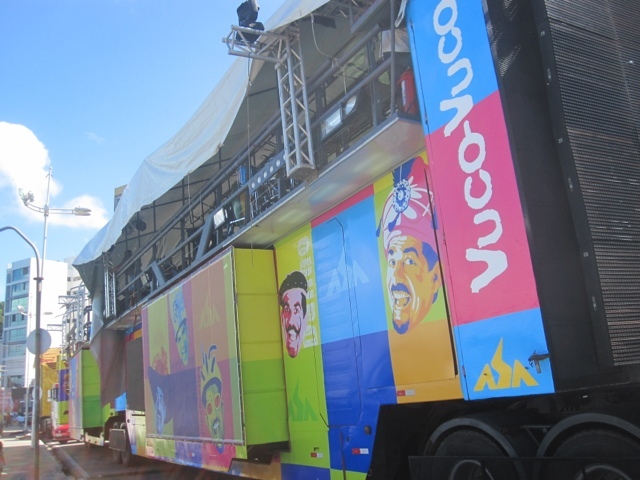 It’s a two-million-people strong whirl of colour and vibrant hedonism, with a daily parade of trios electricos (heavily customised trucks, each with a live band blasting out the music), starting early afternoon and running until 5 am. And lots and lots of dancing! It’s a little hard to describe properly; the best I can come up with is that it’s like they’ve taken a large festival like Glastonbury, made it 10 times the size and then dropped it on the beachfront avenues of a major city. Oh, and it’s all in Portuguese, and the city has a reputation for being dangerous in places. An exotic, if challenging mix! When I say it’s like Glastonbury, it’s not just the dense crowds and amplified music (and fortunately no mud, despite a surprisingly large amount of rain). There are lots of tents in the streets, as in an echo of what we’ve seen elsewhere, the divide between rich and poor is strikingly evident. For much of the low income population in the surrounding area, this is the big time to make money, and so they literally set up camp in the streets, in tents and under plastic banners to sell beer and food to those here to party. Walking back in the early hours of the morning, you can see the thousands of impoverished vendors sleeping rough, guarding their stock with a limb thrown over their cool box, holding on to what little they have. This is all the more noticeable given the huge expense many fork out for Carnaval. In an already expensive country, accommodation prices can go up ten-fold (although we were very lucky to have booked before that happened), and although drinks are cheap, many pay the equivalent of hundreds of pounds for the more exclusive experience of Bloccos and Camarotes. 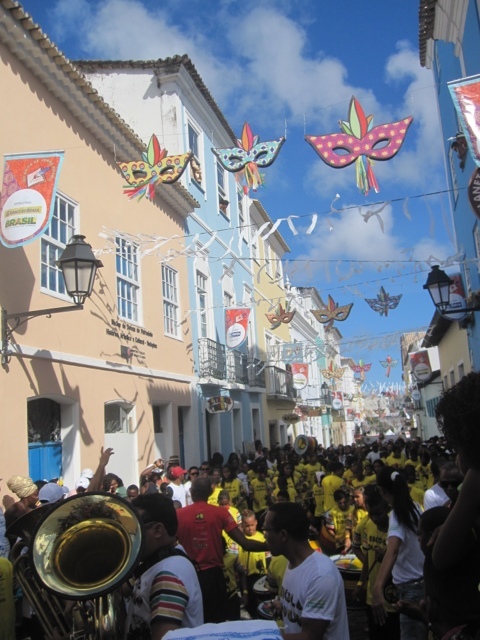 There are basically three ways to experience Carnaval. ‘Pipoca’ means ‘popcorn’, and describes the free-for-all bouncing around and general mele you can experience in the streets for free, buoyed by passing trios and at times squashed by the crowd. In places, pickpockets are blatant and rife (someone even stole a map from my zipped back pocket), but it’s also a great way to experience things and where we spent all our time. By paying for a Blocco, you get a coloured t-shirt that lets you follow a trio inside the rope line that runs 50m in front of and behind it, a moving secure area with a bar and toilets. The third approach is a camarote, essentially a club alongside the parade route, often with an all-you-can eat and all-you-can-drink deal. The prices for just one night at some of these are a crazy £250 – maybe an amazing night, but an equally astonishing price. 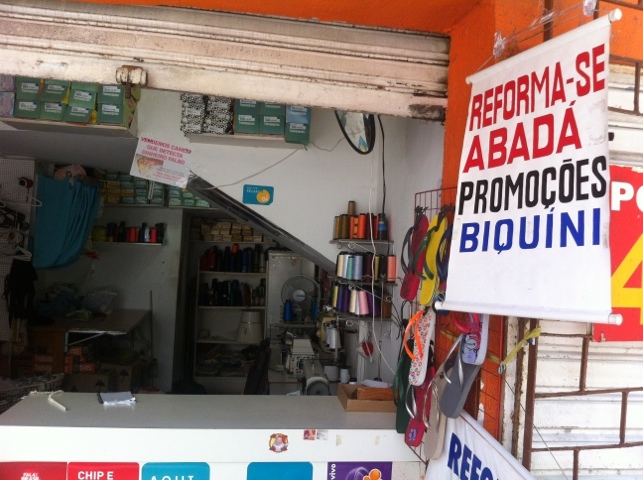 Temporary tailors line the streets offering to customise abadas, the tops people buy to enter a Blocco or Camarote. It's basically a fashion essential for girls. Accompanying the poverty divide comes the security situation. 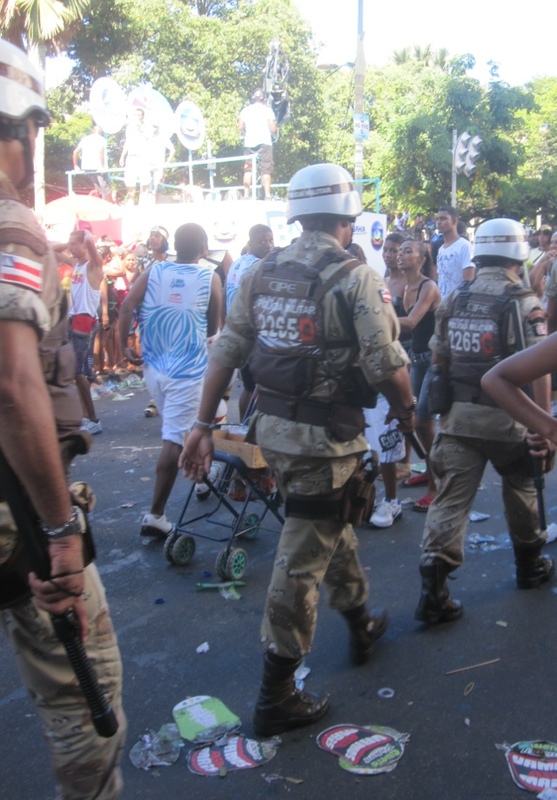 Even outside Carnaval, Salvador has a bad reputation for muggings and violence: a week before we arrived there was a police strike during which the murder rate apparently doubled – from the ‘normal’ 35, to 78 deaths in five days. That’s not to say this is directed at tourists, but it certainly provides a threatening undercurrent to the party atmosphere. I should point out now that we didn’t experience any real problems, or feel unsafe at any time we were there – we wouldn’t have stuck around if we did. You’re warned to have nothing of value with you, definitely no jewellery or cameras, and only a little money hidden in an inside pocket where pickpockets can’t reach. For this reason, we don’t have any night photos – at least until the disposable camera we bought gets developed. Understandably there is a very heavy police presence during the festivities, with lines of 5 armoured and armed military police every 50m or so, either forming temporary barricades to control the crowd, or watching and waiting to be deployed from lookout platforms. When they’re on the move, they cut through the crowd aggressively but effectively – everyone gets out of their way, and at least from my perspective they seemed necessary to maintain order amid the mayhem, even if in a much more draconian and less peaceful way than one might idealise. Interestingly, people say the policing is much more balanced now that each squad has a mandatory woman on the team as well. Nonetheless, I got my first taste of pepper spray thanks to that policing, as they cleared a fight going on a small distance away from us – certainly not an experience any of us with watering eyes and stinging lungs will forget. The final part to the feeling of a strange state of security is the helicopters. Like something out of Hollywood, there are police helicopters continually sweeping very low over the parade route, perhaps 10-20 metres above the ground and with searchlights on. I’m not quite sure what they were doing, but if I needed something to further confirm this wasn’t just Glastonbury, that was it! The other thing that really surprised me was the wild nature of the celebrations for what is essentially a festival to mark the beginning of the religious period of Lent. Back home we have pancake day to use up those domestic excesses; here they have Carnaval. I was expecting the drinking and dancing, but perhaps not quite so much of the lust that goes hand-in-hand with a Brazillian fiesta – and with the local male attitude to forcefully kissing girls that would definitely not be acceptable back home, it takes some getting used to. And this at a religious celebration?! 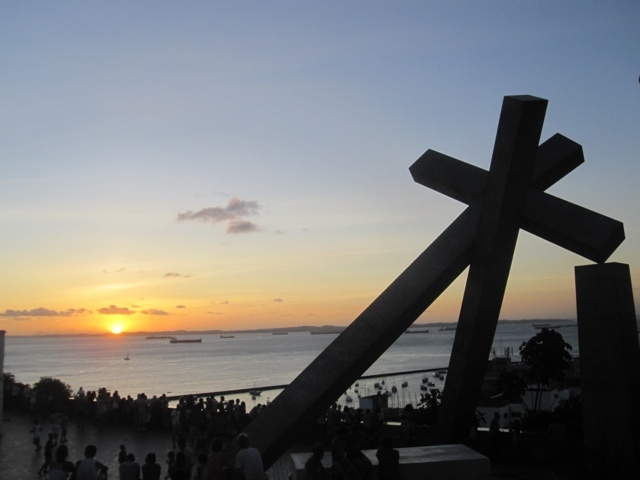 I’ve got mixed feelings looking back at our week in Salvador. The hostel we were staying in was surprisingly only at half capacity, and many of those folks were out doing their own thing each evening, making it a challenge to go out with a interesting and mixed group each evening. At the same time, the last night was utterly amazing, when I lost everyone I was out with and danced until dawn with various people I’d met along the route. 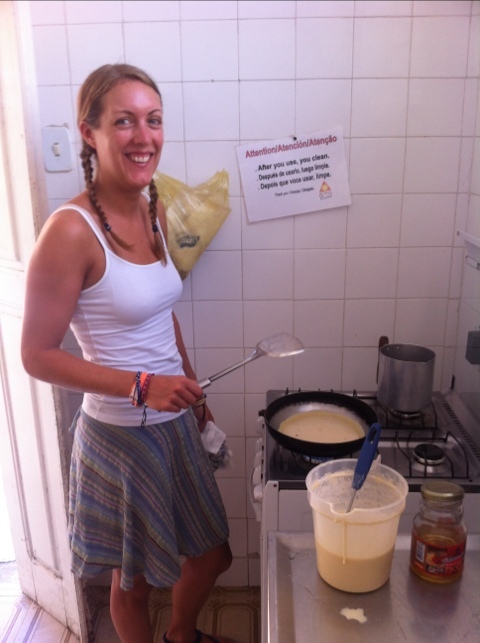 I’ve also got some great memories of snapshots of evenings: of Laura and I discovering what it really was like to be popcorn when we headed out as two of us on the first evening; of dancing with a group of Brazillians from our hostel (one of whom had so much energy we call him ‘Duracell man’); of standing watching duets above me between famous Brazillian singers on Trios and TV stars in their Camarotes on the side of the road; apparently seeing Sharon Stone being serenaded in her TV studio balcony; being part of a massive crowd doing an orchestrated hokey-cokey-like dance to some fantastic Brazilian reggae under the direction of an afro-clad star; doing a scavenger hunt my friend Zoe set me while out amid the mayhem; and finally seeing awards being given out just in front of me on the last night to passing Trios, with the crowd around me in tears from the emotional speeches and myself not understanding a thing but still grinning from ear to ear. All in all, it was an emotional roller coaster, to put it mildly. And as is sometimes the case with overindulgence at the funfair, sometimes you wonder if you could just get off halfway round without going through another loop-the-loop. 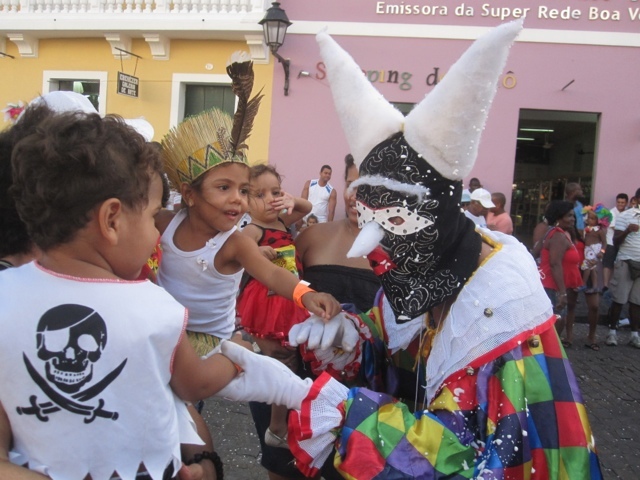 They say Carnaval is a once-in-a-lifetime experience – I think I can agree with that! 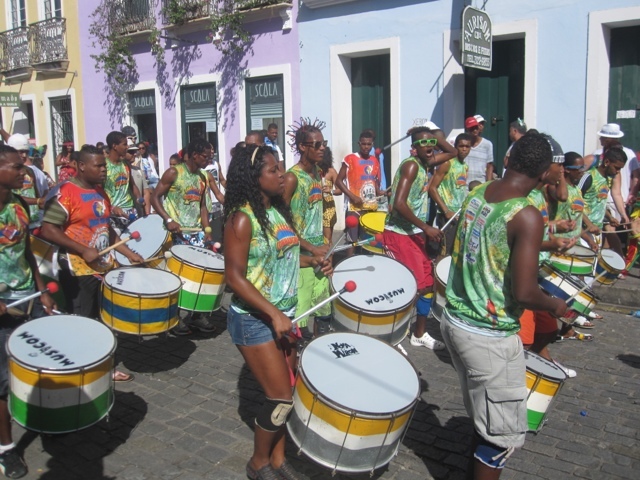 We’re in Salvador de Bahia for Carnival. It’s just about to start, and in a normal world I’d talk about this being the calm before the storm – except this is carnival, so the partying in the streets has started early. And there’s been torrential rain on and off all day. 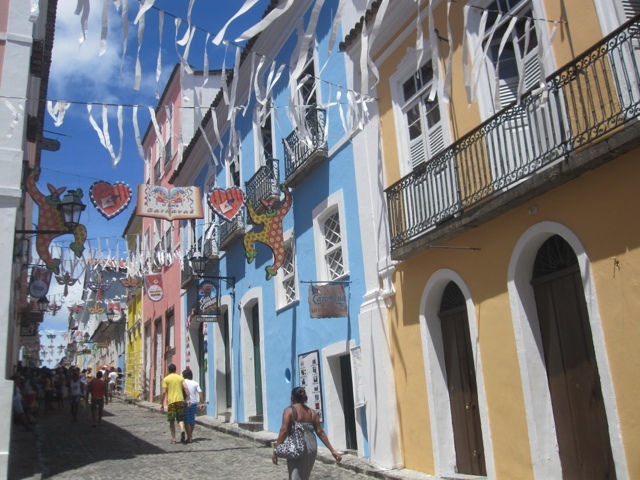 We arrived here very early yesterday morning after spending a week on the beach, first in the touristy but idyllic spot of Arraial d’Ajuda, and then in Itacare, which I first visited with Roland 10 years ago. It’s just as beautiful as I remembered, although the town is now huge compared to the small dirt track that was there before. On a couple of days, we trekked out to the fantastic Prainha beach, a 45 minute walk through the rainforest, past streams and alongside cliffs. 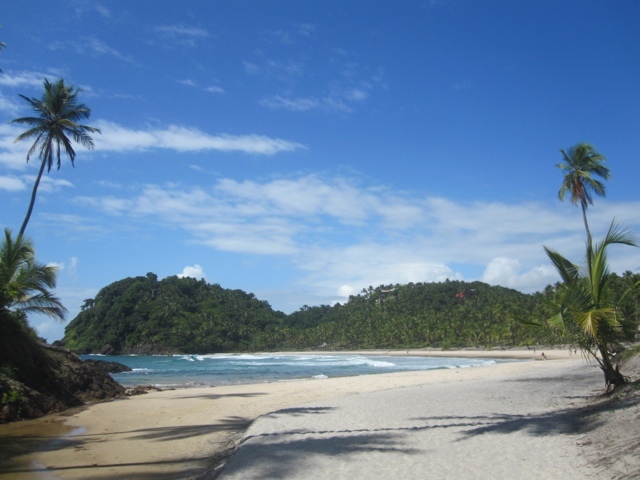 The beach itself is a beautiful stretch of white sand surrounded by green rolling hills and palm trees – the most stunning coast we’ve been to since starting travelling. Hopefully the photos below will make you jealous! 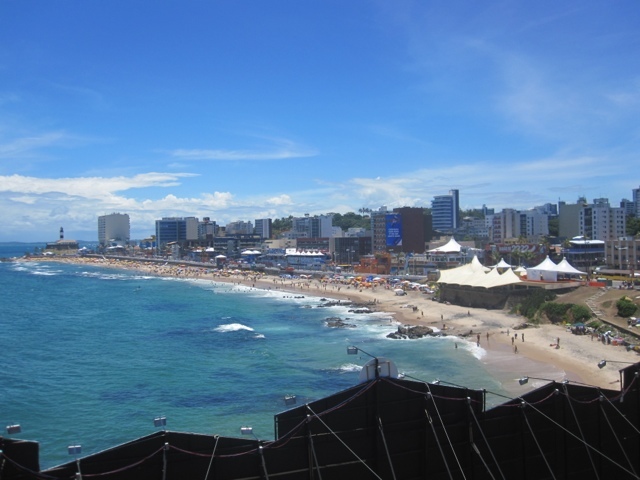 We hadn’t known what to expect in Salvador, except that Carnaval here is meant to be the biggest in the world – millions of people, and many kilometres of parades (Rio is pretty short by comparison). I don’t think we’d quite prepared ourselves for the pre-festival atmosphere – the streets alive with people building stands and crash barriers, and the supermarkets packed high with beer. It feels a bit like Glastonbury the day before the punters get here – a race to get ready, and a sense of utter madness to come. 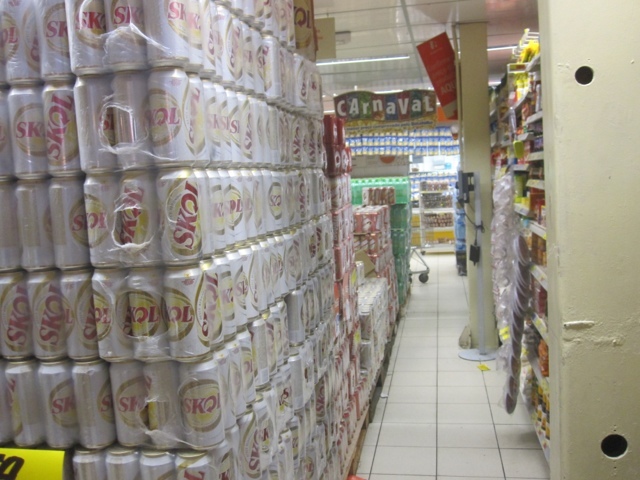 The fairly small supermarket near us has lorries continually arriving to restock the beer, which is just as quickly leaving on flatbed trollies destined for beer sellers around the area. Each aisle has a line of beer crates 2m high down the middle, and there are teams of promoters from each brand trying to convince people to go with their deal. Right now, we can hear the echoes of the music starting in the distance, and the drumming starting up…. I guess we’d better go join them!